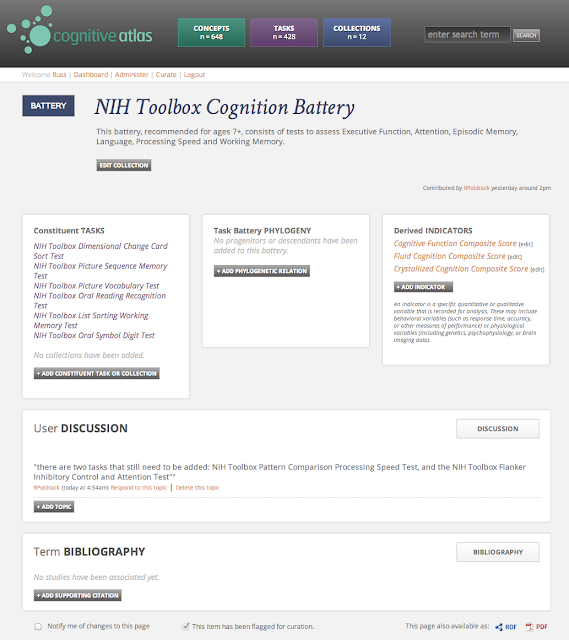 The page lists all of the constituent tasks that make up the Cognition Battery, and links to the separate task pages for each of those tasks. It also allows specification of "derived indicators," which are composite measures that are derived from performance across multiple tasks. Using this feature, we plan to represent all of the neuropsychological test batteries commonly used today. This is clearly just a start at defining this theory, but we believe that this feature can nonetheless provide a very useful formal summary of many of the theories in the domain of psychology. Registered users should go ahead and add their favorite theory today! As always, your thoughts and suggestions are welcome and greatly appreciated! 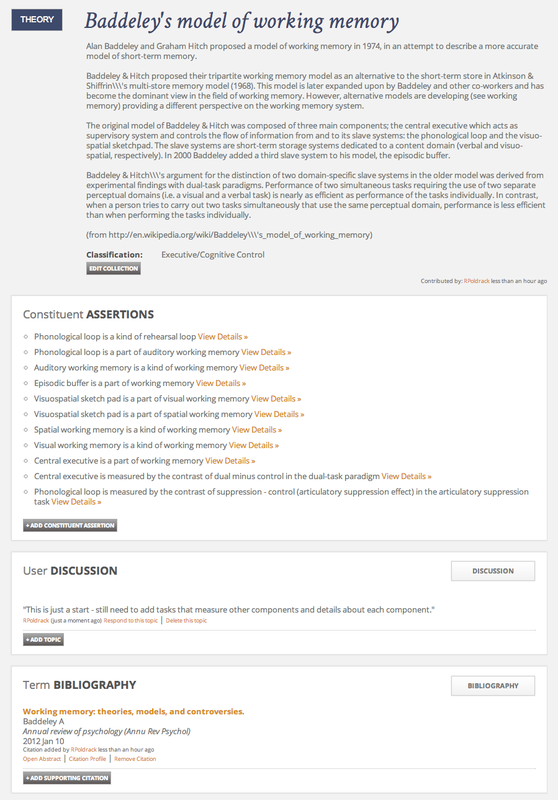 I started with RDF dumps of the concepts and tasks, which are available from the SPARQL endpoint page. Assertions about relations in the database are not currently available from the endpoint, so I got a custom dump of those as well. I then wrote a python script to finesse all of this into an OWL ontology. I have to say that this is a great way to learn about the structure of OWL! I used Protégé to help validate my OWL and examine the contents, which was really useful. Part of the work in setting up this ontology was deciding how to align it with other ontologies, particularly with CogPO. I had a long meeting at OHBM2011 with Jessica Turner and Angie Laird, during which we hashed out a set of classes and relations that will serve to structure the task representation in both of our ontologies. 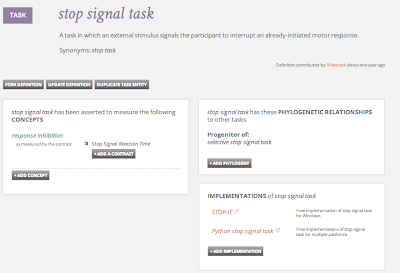 For our representation of tasks, we are inheriting the BehavioralExperimentalParadigm class from CogPO. I have also registered the Cognitive Atlas with the NCBO BioPortal site, which I hope will give it increased visibility. In the long run, I plan to create a pipeline by which the ontology will the automatically generated and updated directly from the database, but for now will do regular manual updates. We have also welcomed Jack Van Horn from UCLA to the Cognitive Atlas team; Jack will be working with the rest of the team to develop new ways to seed the database and visualize the results. I have also just recently made a thorough curation run through the database and will soon be cleaning out the database. Discussions with a number of people (particularly Gwen Friskoff from Georgia State) highlighted that there were some terms in the database that were not really mental constructs. For example, there were a number of linguistic concepts (such as "vowel" and "agglutinative language") which refer to things in the world rather than to mental constructs. Because the concepts list in the Cognitive Atlas is meant to include only mental constructs, these are not appropriate for the knowledge base. Instead, a concept like "vowel processing" would be appropriate because it would refer to a mental construct rather than to a thing in the world. Another common confusion is between tasks and concepts. For example, "trace conditioning" was previously listed as a concept in the database. 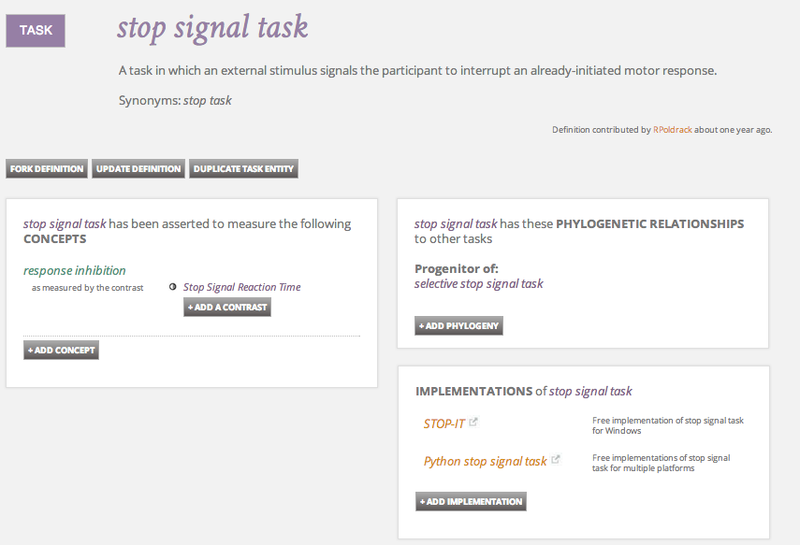 However, trace conditioning is an empirical phenomenon that is evoked using particular learning paradigm; it is, of course, supported by particular learning processes, and it is those processes that count as mental concepts, rather than the experimental paradigm, which should instead be listed as a task. Finally, we are in the process of making a thorough sweep through the task database, integrating with a number of other task lexica, and cleaning it up so that entries are more consistent. We look forward to your continued contributions and always welcome feedback about the project.